The first step proposed to the makers in the Making Business Models workshop is to focus on values. Let’s see what does it means, thanks to a short phone interview to Andrea Cattabriga. All fablabs and makerspaces have to bring with them a fair amount of values connected to social impact. It’s a mission part of their organisations to pursue aims of social innovation, through their tools and people working together. How is it possible to spot values? Why should we spot values? The participants of the workshop during the last days have filled some project cards. In the project cards they already had to express some values, putting parameters in a scale 1 to 10: profitability index, economic relevance and social impact. They are only a starting point, because values generated by a makerspace are often very far from economic fixed parameters. For this reason, we need an empirical and collaborative method to spot the most important. 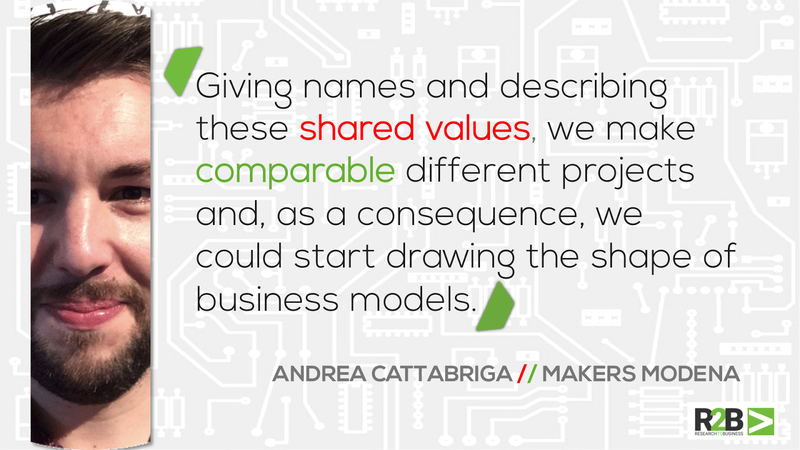 Finally, giving names and describing these shared values, we’ll make comparable different projects and, as a consequence, we could start drawing the shape of business models.